…Don’t be put off by their rather acrid smell and make either of two delicious dishes! These Rognons de Veaux were served in a kind of deep soup bowl with a sauce of what tasted like reduced veal stock, sauteed onions and very ripe chunks of avocado. As a preparation it was as delicious as it was surprising that something so commonly reviled would be served with avocado. When we returned to the US after that trip, we were enthused but a little apprehensive to try to recreate this dish ourselves. Neither of us had ever cooked kidneys of any kind before and so were unsure what to do with them, even if we could find them. However, veal kidneys aren’t the kind of thing we eat very regularly because they, like most offal, are high in cholesterol and other bad things that taste good, and because they are so rich tasting, not to mention being kind of a pain to prepare on a weekday night. So it wasn’t until this past weekend that we decided to make them again, but this time we wanted to try a different recipe. My wife, Amy, had done quite a lot of research, looking into possible recipes but by the time we got around to starting the preparation, our wireless internet cut-out and we had to muddle along with only the vaguest idea of a recipe. So the recipes that follow are delicious and make a potentially awkward ingredient into a gourmet preparation, but neither are actually established recipes, per se, since the first one is our attempt to recreate the dish we ate in Banyuls, and the second is our attempt to make a dish we only knew of by name. Thankfully, both worked out pretty well, but if anyone out there has any more tried and tested kidney recipes (apart from steak and kidney pie – I’m English, so I’ve already got a good one) we’d love to hear about them! Enjoy! We have also entered this recipe to Hunter, Angler, Gardener, Cook’s “Meat & Greet” event! Sautee onions and garlic in 1/2 of the butter until soft and translucent before removing them to a plate. 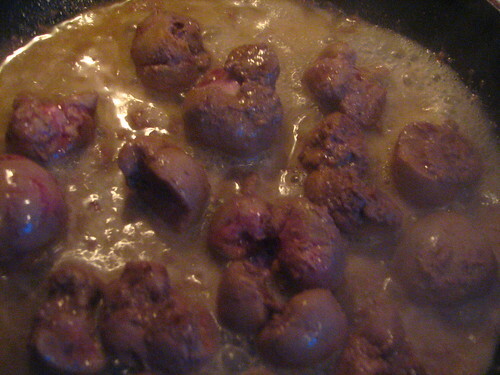 Add second half of the butter and increase heat under pan to medium-high before adding the chopped up kidneys. Kidneys will give up quite a lot of liquid while cooking so it is important to keep heat relatively high at this stage. Cook for 7-10 minutes or until firm to touch. Return onions and garlic to pan with kidneys, add stock to a depth 1/2inch and let reduce by half. Add half the avocado and let liquid reduce by 1/2 again. Avocado should have melted into the sauce at this stage. Kill heat and add remaining avocado. Taste sauce. Season with salt and pepper accordingly. Sautee onions and mushrooms in 1/3 of the butter until soft. Add garlic and cook for a further 3-5 minutes before removing from pan to a plate. Set aside for later. Add second third of the butter and turn up heat to medium-high before adding kidneys. Cook for 7-10 minutes until firm to touch. Return onions, mushrooms and garlic to pan and turn heat to high. Add cognac. Let liquid reduce almost completely before adding about half the stock/water. Let liquid reduce by about 80 percent and mixture looks quite thick. Kill heat. Stir in remaining butter and sour cream. Taste and season accordingly. Sprinkle in parlsey before serving. We served it on a round of toasted French/Italian bread, but it would also be good over some baby spinach or even radicchio leaves. 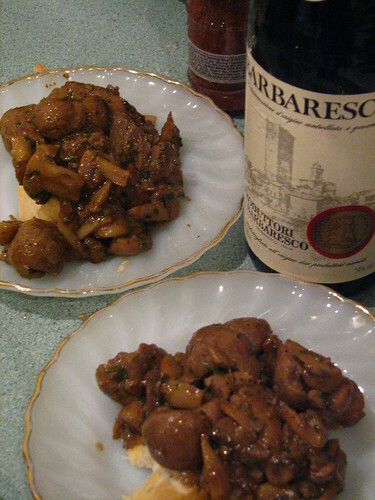 We washed it down with a wonderful bottle of Barbaresco that we brought back from Italy. We very rarely drink anything that costs more than $10/bottle, so any powerful red wine would probably work well. Kidneys aren’t the thing I eat at all, but as I am writing this to you, my buddy, who also is English (Essex) and must have his weekly ration, is preparing his skilletful of beef kidneys. After making sure all exhaust fans were set on HIGH, I commented to him that in childhood I was taught to soak the likes of shark and swordfish in milk to take care of tasty/smelly urinary matters– so why not kidney? A little research and voilà, that’s what’s recommended! The question is: “what exactly,” in chemical terms, does the soaking-in-milk-before-cooking have on the flesh of these “delicacies”? interesting English connection with the kidneys and thanks for your comment and for finding our blog. I only ever ate kidneys in a steak and kidney pie in England, and it took a trip to France before I ever, knowingly ate them in any other form. My research suggests that using milk to neutralize the pissy smell is, and has been for years in poorer parts where they eat kidneys, a tried and tested technique. I can find no reference for actually why it happens but investigation of http://www.vidagest.com – a kidney cleansing pill – suggests that since kidneys normally absorb many of the mineral nutrients your body needs – potassium, calcium, sodium,magnesium, phosphorus – at least some of which occur in sizable quantity in milk, kidneys might absorb milk because its constituent parts are absorbed naturally. And, since the kidney removes excess salt from the bloodstream and replaces it with nutrients, is it not possible that replacing uric salt with good stuff neutralizes the stink? Of course, this is all my idea. I’m no scientist, but it makes sense to me. Your thoughts are welcome, since I could be making all this up! Hey there — thanks for entering Meat & Greet! The milk soak for kidneys is a must for all but rabbits and squirrels, which are so small they need not be bathed in moo juice. I am not 100 percent certain, but my hunch is that it is an osmotic thing: There are more minerally, urea-laden icky things in the kidney (HATE beef kidneys, BTW – I stick to venison, antelope, lamb and veal) than in the milk, and since salts of various forms are a key component of urine, they leach out of the organ in precisely the opposite way salt leaches into meat when you brine it. Does that make sense? am i running out to find veal kidneys? Now that everyone’s talking about the new movie, Julia and Julia (or is it the other way around?) I was thinking about the dishes I cooked on a regular basis from Mastering the Art.. in 1964 and beyond when I was a bride in Brooklyn Heights. Julia’s “Rognons de Veau en Casserole” (kidneys cooked in butter with mustard and parsley sauce) was a quick week night meal for us. The kidneys were cheap and easy to find at Key Foods on Montague Street. Once I left Brooklyn for the midwest it became impossible to find them and over the years I forgot about them. I think I’ll try to track some down for old times’ sake! What a wonderful comment, Pru. We’re so glad someone else can appreciate the often misunderstood (in this country, at least) kidney. Key Foods is also our grocery store – but the park slope location. Kidneys and liver are still about 99 cents per pound (or less). We have lots of liver recipes on our site too if you are into that as a quick, easy and delicious meal. Just go to the “search” box on the right and type in liver. Thanks for the comment and hope you come back – maybe after you’ve reintroduced yourself to the lovely kidney! I was taught to cook the kidneys first in water and then to saute them……….this step seems to be missing in the recipes above. @Jeri – thanks for sharing. We soaked our kidneys in milk first, and they turned out well. Perhaps there is more than one right way to prepare them? As a Frenchie, I can share my secrets for cleaning kidneys before they are sauteed. they must be pared… a bit like you would do with duck liver… all traces of fatty white matter has to be eliminated and the kidneys cut into small lobe sized pieces (about an inch in diameter). Then they are rinsed (immersed then drained) in fresh water 3 times. The smell disappears with the rinse water. Kidneys should be cooked on high heat for just under two minutes. If they are cooked more than 2 minutes, you have to go all out and cook them for 30 minutes (over lower heat of course), otherwise they will be tough. My favorite special weeknight recipe (ultra fast) is to sauté the kidneys in butter, add a splash of port or madeira wine continuing to cook until the alcohol evaporates. I then reserve the kidneys, add a heaping tablespoon of Dijon mustard to the pan, diluting the cooking juices in the mustard. I finish off by adding a generous splash of light cream. I season with salt and pepper to taste and return the kidneys and whatever juices to the pan, reheating before serving with a green salad dressed with olive oil, vinegar and a clove of garlic. Bon appétit! @GatoAzul: thanks for the tips, the recipe and the feedback! That sounds really, really good, and totally doable on a weeknight, even if we probably wouldn’t make it more than once a quarter to keep our cholesterol in check. As you can see, our kidney recipes haven’t exactly been the most popular of our posts to date, but we have a couple of others up our sleeve, including a Burgundian one for kidney and bacon skewers. Disgusting people! How can you even think of eating a kidney!! FOr heaven’s sake it is an organ used to clean and filter body’s wastes…can you think of cleaning and eating on a sewage or gutter pipe? Seriously when nature has so many fresh fruits and vegetables to offer all you can think of is eating kidney! and that too of baby calves! @Anna: If nobody is forcing any kidneys down your neck, why do you feel the need to tell us what we should and shouldn’t eat? Go back to your quinoa and tofu salad and leave us to our kidneys. Thanking you.